Grumpy Cat Limited sued the owners of US coffee company Grenade for exceeding an agreement over the cat's image. 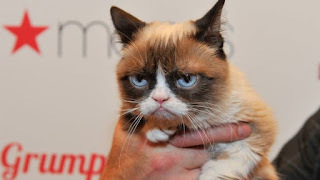 The company only had rights to use the cat to sell its "Grumppuccino" iced drink, but sold other Grumpy products. Originally posted on the social website Reddit by the brother of the cat's owner, Tabatha Bundesen, the image of the cat quickly spread as a meme with funny text captions.